I don’t know if it’s my experience reading about anarchism, its ideas and history (notice I’m not saying “understanding”), but the writings in The Method of Freedom are consistent, easy to understand, and for a 530 page book, this is a pretty easy read. There are many themes and ideas that Malatesta explores in these writings which range from how to organize (and who to organize with) to what anarchist values should be, to what positions the anarchist have had throughout the years. All are explained very plainly and effectively and very consistently might I add (is this due to the editor picking and choosing, I wonder?). It’s also clear that Malatesta was a pretty witty man and it shows in these writings. I don’t mind that one bit either. 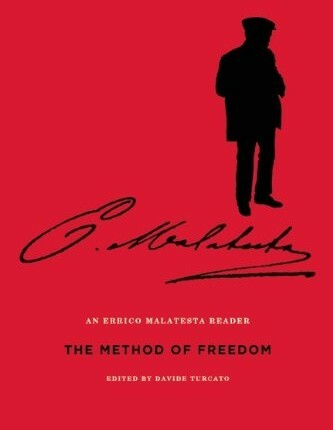 What I love most about this book is how Malatesta doesn’t shy away from putting anarchists (and himself) to task for coming short in their actions and theories, like failing to support strikes, attempting to join governments, and undermining how important it is to teach the multitudes so as to facilitate revolutionary action when the time comes. Also, there’s an article here which is almost completely dedicated to raking Kropotkin through the coals and criticizing some of his ideas including his support for the first world war and his lack of realism concerning how much teaching anarchists still have to do. Very gutsy and refreshing in a political environment where anarchists tend to always take the idealistic high road.